Presented by: Aqua Moon Adventures, Dolphin Swim Team of Bermuda, Bermuda Open Water Swimmers (B.O.W.S.) and the Bermuda Department of Tourism. 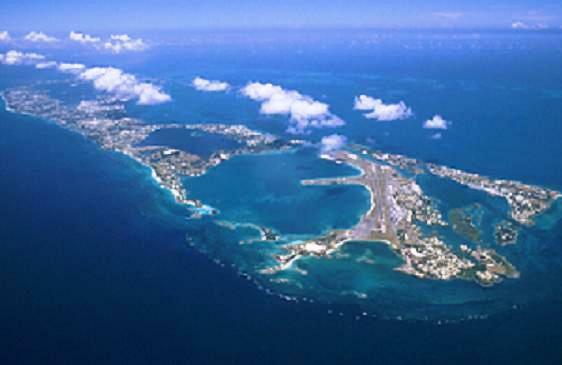 An overseas territory of the UK Bermuda boasts 75 miles of dramatic coastline. Rich in history it lies in an astoundingly beautiful stretch of the Atlantic a mere 650 miles east of North Carolina. Flights from New York and other eastern US cities reach Bermuda’s shores in less than two hours. The open water swimming events take place in beautiful Harrington Sound. Bermuda’s water temperature in October averages 78. We are pleased to announce that the Grotto Bay Beach Resort will be the official event resort. Grotto Bay has offered a discounted event rate for those coming to the Round the Sound Swim. The number of discounted rooms is limited - please reserve ASAP. To receive this special rate mention that you are with the: Round the Sound Swim Group. If calling from the United States or Canada call toll free 1.855.447.6886, all other destinations 1.441.293.8333. Ask for extension 1906 or 1960. Complimentary group transportation to the swim event and other optional group swims will be provided to those swimmers staying at Grotto Bay. Grotto Bay is a short five minute taxi ride from The Bermuda International Airport. 5:00 - 5:30 p.m. Optional Grotto Bay’s “Welcome to Bermuda Rum Swizzle and Snack Social.” Meet the swimmers on the front patio and enjoy complimentary cocktails and snacks. 8:30 - 9:15 a.m. Optional sunrise stretching & yoga. Bring a towel and gather on the beach at the Grotto Bay Beach Resort. 10:00 -12 Noon Optional group swim –location TBD. Meet outside the front lobby of The Grotto Bay Beach Resort at 9:50 AM for round trip bus transportation. Depending on location drinks and snacks may be available so bring cash if you would like them. 10:00-2:00 p.m. Group swim and social from 10:00 a.m. to 12:00 noon at GOMBEYS at Clearwater Beach. Then from 12:00 noon to 2:00 p.m. we will hold our Mandatory Pre Event Briefing at GOMBEYS at Clearwater Beach. Event t-shirts and goodie bags will be distributed and the event course, timeline, rules, and questions will be answered at this meeting. For round trip transportation meet outside the front lobby of The Grotto Bay Beach Resort at 9:50 a.m.. Drinks and snacks available so bring cash. Busses will return to Grotto Bay around 2:00 to 2:30 p.m. Bus transportation will be provided to the race start from Grotto Bay per the schedule below. Please be in the lobby area at least 15 minutes before your bus is scheduled to depart Grotto Bay. 10:00 a.m. Events begin in a staggered fashion per schedule below. 2:30 p.m. (approximately) Awards ceremony at beach/finish dock. Evening celebration and social: A post race tradition! We will gather at THE SWIZZLE INN next to Grotto Bay. The time will be announced at the awards ceremony. 10K 8:45 a.m. Aquarium 10:00 a.m.
7.25K 9:45 a.m. Radnor Estate Rd. * 10:45 a.m.
4K 10:45 a.m. Shark Hole 11:45 a.m.
2K 11:15 a.m.** Turtle Island 12:15 p.m.
.8K 11:15 a.m.** Harrington Sound School 12:45 p.m.
**Spectators on last bus will be dropped off at the finish line. *For travel to Bermuda, you must have a current/valid passport. It is your responsibility to meet all entrance and departure requirements. Please check with the airlines and your government for additional requirements. *It is your responsibility to attend the mandatory pre-race check in and all scheduled meetings as important event information and potential changes will be discussed. *Due to the nature and complexity of this event no refunds will be given for any reason including event cancellation. 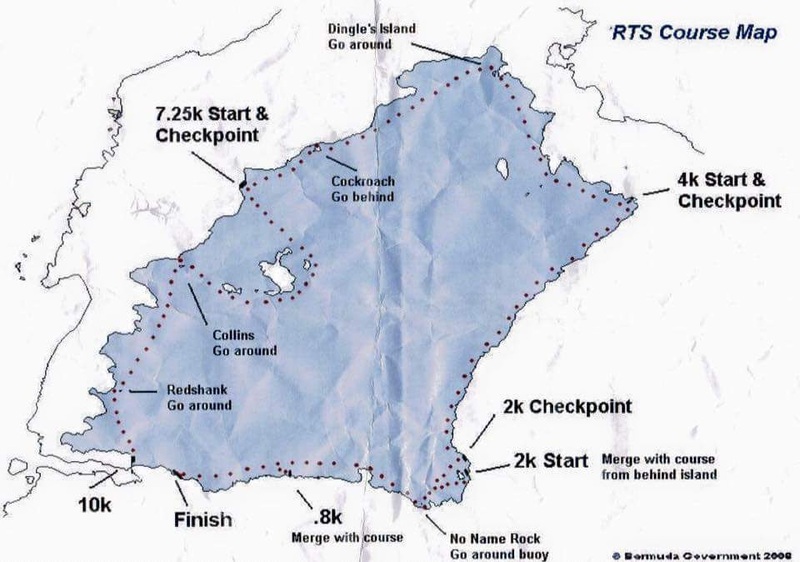 The race director(s) reserve the right to modify any and all information relating to this event at any time. As a condition of participation in this event all participants will be required to sign a Waiver/Release of Liability and also an event authorization form at the mandatory check in. Q: Do I need a support boat? A: No. safety craft are monitoring the course. Q: Are there water stops along the swim course? A: Yes, there are several water stops along the course. Q: How will I navigate during the swim? A: The course will be marked. In addition you will receive information on the course during the pre-race meeting. A: No. The water temperature has averaged 78 degrees the past several years in Bermuda in October. Q Do I need to rent a car while in Bermuda? A: Cars are not available to rent in Bermuda. The two best options for travel while on island are by bus or taxi. The bus system is wonderful, clean, and on time! You can purchase transportation passes for the days in your stay directly from your hotel. Another option is moped/scooter rental. Transportation is provided for the participants from the Grotto Bay Beach Resort to the group swims Friday and Saturday morning, the pre-race meeting, and to the event on Sunday. Q: Are there socials planned? A: This is an Aqua Moon Adventures event which means while on island it is one big social. Sunday evening after the event we will socialize at the Swizzle Inn which is next door to the headquarters hotel: The Grotto Bay Beach Resort.